On October 9 of that year, William Waldorf Astor hosted an “informal” dinner for fifty politicians, financiers, and other civic-minded gentlemen at Delmonico’s uptown location on Madison Square. The purpose of this event was to discuss how to make New York City the site of the next World’s Fair. In the nineteenth century such expositions were taken very seriously as displays of national prowess and commercial expansion. 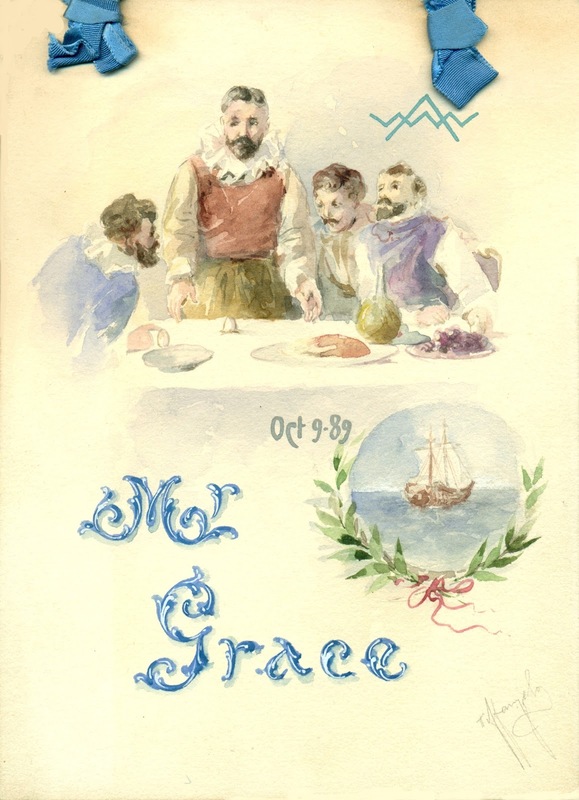 The fair, scheduled for 1892, was intended to celebrate the four-hundredth anniversary of the landing of Christopher Columbus—a theme reflected on the menus for the Astor gathering, made specially for the occasion by Tiffany & Co. Tied together at the top with two silk ribbons so as to stand upright, each bore its own distinctive, hand-painted scene depicting the explorer’s voyage of discovery and incorporating Astor’s monogram and the name of the guest. Delicately rendered by the stationer-turned-jeweler were the approaching ships and subsequent feasts that would eventually spell near-doom for the Canvasback. For this evening Chef Ranhofer improvised by substituting the smaller teal duck (probably the blue-winged variety, which he regarded as having a particularly excellent flavor) and accompanying it with a celery mayonnaise. New York, St. Louis, Washington, and Chicago were all competing to host the fair. 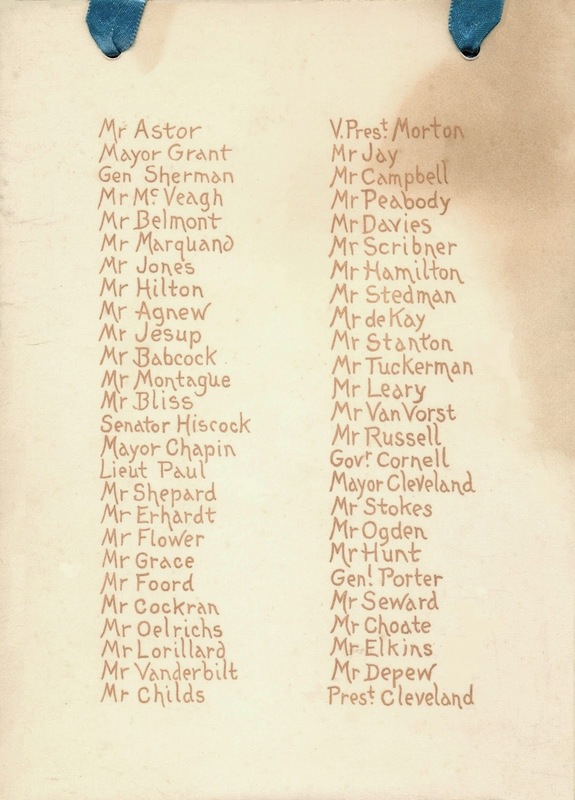 The intense rivalry over which city Congress would select was not only a question of prestige. There were also some opportunities for profit, especially for those with investments in hotels, railroads, and real estate. 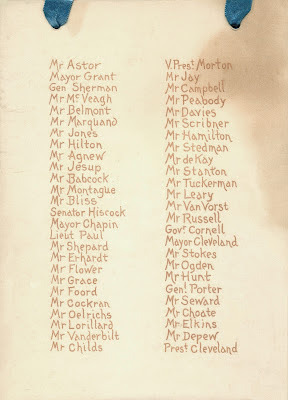 Many of Astor’s guests (whose names were listed on the back of the menu) were working to build the case for New York, such as Chauncey Depew, president of the New York Central Railroad who was acting as the chairman of the “World's Fair Committee,” and Cornelius Vanderbilt II, scion of the wealthy family whose business interests Depew had long served. This dinner was an opportunity to discuss the matter over a meal whose refined cuisine and well-defined structure stood in marked contrast with the messy political process in which the men were engaged. No matter how carefully orchestrated, however, neither the dinner nor the fair was destined to unfold without surprises. Festooned with flags and banners for the occasion, Delmonico’s third-floor banquet room featured a single, circular table with a hollow center filled with plants and shrubs. An orchestra was on hand to play the musical interludes that would provide an occasional respite in the conversation. As the host, Astor sat facing the door with the guest of honor, former President Grover Cleveland, seated by his side. Cleveland had moved to New York earlier in the year after losing his bid for reelection to Benjamin Harrison. In 1892 he would run again and win, becoming the only president to serve two nonconsecutive terms. In the meantime, Cleveland had the dubious pleasure of looking over the foliage at Vice-President Levi Morton, Harrison’s running mate, seated opposite him on the other side of the large circle. The guests that evening were uniformly wealthy and powerful. This was the group shaping fin-de-siècle New York—adorning it with their art, bestowing it with their vision, and even stamping it with their likeness. The menu shown above was specifically intended for William Russell Grace, the former mayor of New York, who just a few years earlier had formally accepted the Statue of Liberty from the French Republic. During his first term of office, President Cleveland, along with others at the dinner, had presided at the 1886 dedication ceremony. That project, not unlike their current undertaking, had been an expression of American optimism and a source of city pride. The menu shown below for General Horace Porter, a major force in the construction of Grant’s Tomb in Riverside Park, now resides in the New York Public Library. Another retired general in attendance, William Tecumseh Sherman, was destined to leave his mark on the city’s landscape as the model for the gilded-bronze equestrian monument in the Grand Army Plaza in Central Park.3 Earlier in the year banker Henry G. Marquand had donated Vermeer’s iconic Young Woman with a Water Pitcher to the Metropolitan Museum of Art. Such a grand dinner would typically last about two and a half hours, providing ten to fifteen minutes for each course. The service began with the prescribed sequence of dishes, starting with oysters followed by a soup, a light dish, a fish course, and entrées. 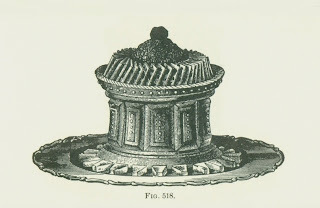 In a departure from protocol, the remove, a joint of meat that was presented and carved in the dining room, was served between the two entrées (on menus of the era the remove course was also called the relevé). This evening the remove was a saddle of mutton, sliced thin and placed on hot plates with a little gravy. Royal Charter Champagne, introduced with the fish course, also accompanied both entrées and the remove. All of the wines served at this dinner, including Royal Charter Champagne, a brand that no longer exists, were routinely stocked in Delmonico’s wine cellar. After the sorbet came the roast, typically a game dish—in this case, the teal duck, which perhaps brought to mind the disquieting situation in the Chesapeake, momentarily shifting the conversion to the plight of the Canvasbacks. The cheese course soon followed (the cold dish having been “promoted” from its customary place to a more prominent position) and, finally, a simple dessert was served.8 The evening ended with two fine wines, Chateau Lafitte (sic) and Old Reserve Madeira. 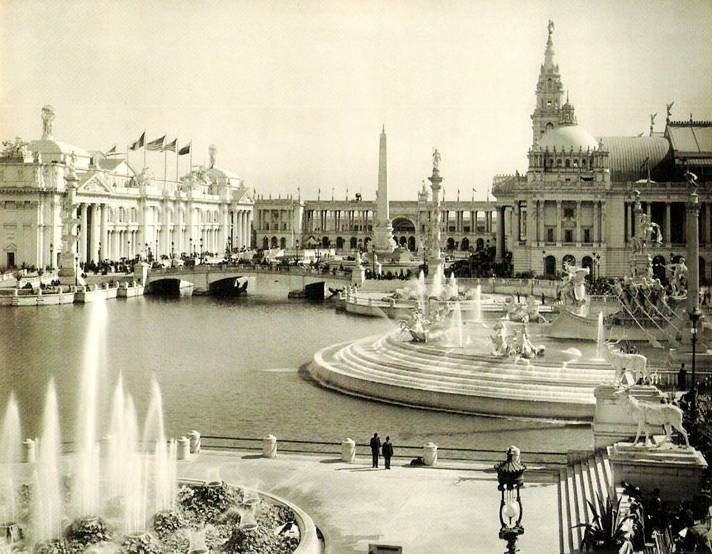 Congress ultimately awarded the World’s Columbian Exposition to Chicago. In the end, the likes of retailer Marshall Field, industrialist Cyrus McCormick, Jr., and meat-packers Philip Armour and Gustavus Swift had outdone their powerful counterparts in New York. By the time the fairgrounds were finally completed, behind schedule, President Cleveland had returned to the White House for his second term. Newly elected, he traveled to Chicago to open the fair on May 1, 1893—four hundred and one years after Columbus’s voyage. 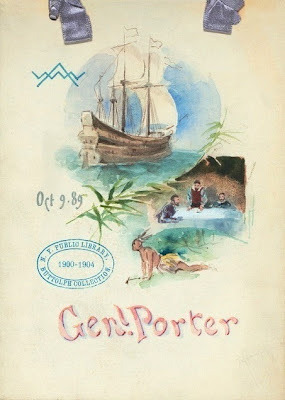 When “Manhattan Day” was celebrated as part of the Exposition’s festivities, General Horace Porter, one of the invited speakers, graciously declared: “Our cities were contestants for the exposition. Chicago fairly won the prize. Today the people of New York come to greet you, not only through their representatives, but they come themselves with hearts untouched by jealousy. With souls unmoved by rivalry, to cry out to you with acclaim, God bless Chicago!” The fireworks in the Windy City that evening included sparkling displays of the Brooklyn Bridge, Father Knickerbocker, and the Statue of Liberty. 1. Canvasbacks are large migratory ducks found throughout North America. They will feed on mollusks when they unable to find their preferred diet of wild celery, however, this change in diet adversely affects their unique flavor, causing them to taste much like other species. In the fall of 1889 the canvasbacks did not arrive in large numbers at the Susquehanna Flats, the twenty-five thousand-acre water area normally abundant with wild celery. The problem was caused by floods from the river which covered the aquatic plants with mud, prompting the ducks to fly farther south looking for food. During the season from September 1889 to April 1890, the canvasbacks were hunted in North Carolina and shipped to New York via Havre de Grace in an effort to deceive the buyers. Given the lesser quality of these ducks, the best chefs in New York removed them from their menus that year. The situation fueled a growing concern that the species had been “shot out.” New York Times, 17 December 1889. 2. New York Times, 27 February 1890. William Waldorf Astor (1848-1919), the only child of John Jacob Astor III, inherited an enormous personal fortune upon the death of his father in early 1890. 3. Sculptor Augustus Saint-Gaudens created a bust of William Tecumseh Sherman in 1888 that became one of the preliminary works for his larger-than-life equestrian monument that was unveiled in Central Park in 1903. 4. Charles Ranhofer, The Epicurean, 1893, p.723. 5. Although Ranhofer did not include the recipe for the Bellevue variation of Pâté de foie gras in his cookbook, he described the process for making a cold dish glazed with aspic jelly in his recipe for galantines de perdreaux en tranches et en Belle-vue (The Epicurean, No. 2494.). 6. In the days before refrigeration, a complex cold dish was created in advance so that the multiple steps of the process were not hurried. 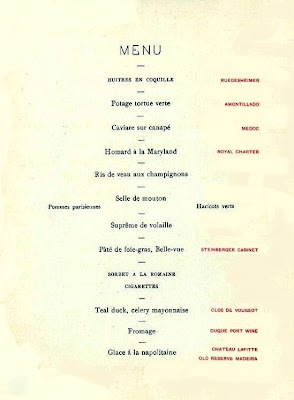 There is evidence to suggest that the pâté de foie gras, Bellevue at the Astor dinner was prepared on the previous day. 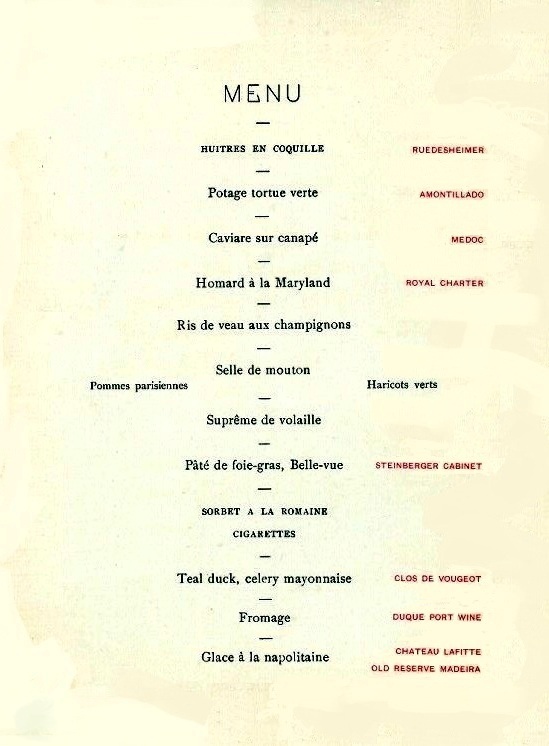 As luck would have it, there is a menu in my collection which shows that petits aspics de fois gras (The Epicurean, No. 2412) was served at an unrelated banquet at Delmonico’s on October 8, 1889. This simpler dish was made by molding slices of goose terrine and truffles in aspic using small, flat timbales. Considering the cost of these expensive ingredients, and the fact that no food was wasted in a commercial kitchen, even at a luxury establishment like Delmonico’s, the petits aspics de fois gras was probably made with the trimmings leftover from the preparation of the more elaborate pâté de foie gras, Bellevue. 7. Cigarette production increased in the early 1880s with the introduction of automated rolling machines, although per capita consumption was still low compared to the phenomenal increases of the twentieth century. Although not the largest manufacturer of pre-rolled cigarettes, Lorillard produced an early brand called Taylor Mades. 8. According to the custom of the time, the fancier, more elaborate desserts were only served when women were present at the dinner. It seems odd to me that the teal duck is so far down on the menu. Another gorgeous post, Henry. I remember reading about the dearth of canvasbacks and read a few old NYT articles crying about it. Conservation was urged by the wealthy to preserve their favorite dish. Perhaps not a great reason but a good outcome. I am still waiting to find someone who will get me a canvasback fed on wild celery... a dream of mine. So wonderful to read this post, after I took notes on what you had told me when I came out for a visit this summer! Your writing and sleuthing skills are both terrific. Thanks!